4 Bedroom Semi Detached House For Sale in Marlborough for Guide Price £500,000. 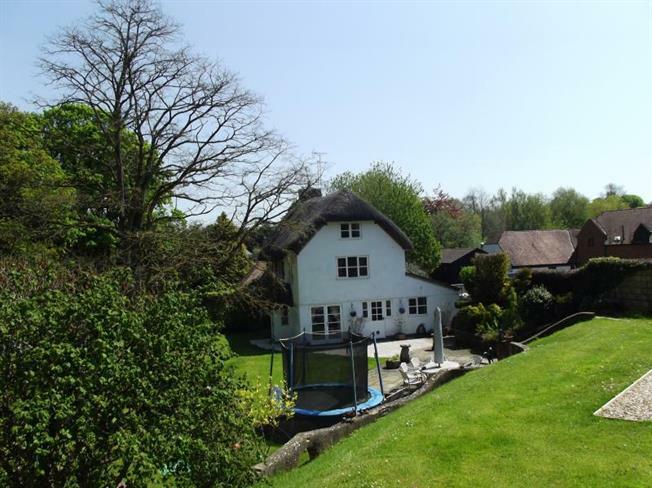 A charming 17th Century unlisted thatched dwelling set in approx. 0.42 acre which has been sensitively refurbished and updated whilst retaining wealth of period features. The stylish Moben kitchen has been fitted with a comprehensive range of floor and wall units with granite work surfaces over and benefits from under floor heating. The sitting room offers an inglenook fireplace with large wood burner and original bread oven, oak flooring and numerous exposed ceiling beams. Via the sitting room, there is a study area, incorporating a fitted handcrafted oak desk. In addition, there is also a useful utility room with an adjoining refitted downstairs shower room. There is a separate dining room with reclaimed oak parquet flooring and French doors to the newly laid patio area. On the first floor, there are three generous bedrooms , one of which is en-suite and a beautiful family bathroom with roll-top bath, oak flooring and mosaic wall tiles. On the second floor, there is a further double bedroom with eaves storage throughout. The Cottage is in a 'tucked away' position off Church Street. The mature gardens are predominately laid to lawn, all enjoying a good degree of seclusion with various trees, including an impressive Acacia tree and brick-built outbuildings. The vendor has also recently re-laid the patio area and re-gravelled the driveway, which provides off-street parking for several vehicles. There was full planning permission (expired) to build a separate detached family home (E/10/0082/FUL) in the grounds, subject to a payment for access.